In 2012 we decided to go into business on our own serving our South Central Texas Community. 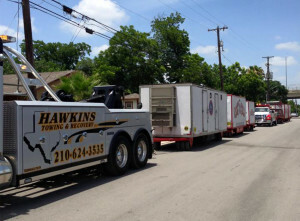 Hawkins Towing and Recovery is a Limited Liability Corporation. We are fully insured to ensure that you are financially protected in everything that we do. Hawkins believes in old fashioned values like treating everyone the way that we’d like to be treated. We care for our customers as we care for our families. We are a company with compassion for those we serve. Hawkins employees will make it a point to do anything within reason to make our customers happy and satisfied. We do background checks on all of our employees. They are certified, uniformed and well experienced in the jobs that they perform for you to insure the best quality service to our customers. At Hawkins you’ll find old fashioned customer service, top quality customer care and careful attention to every detail of the jobs that we perform for you. Whether servicing heavy equipment on the oil fields or recovering your car from a fender bender, you can depend on Hawkins where you’ll get great service at a fair price.